We are anchored at Bullock Harbor in the Berry Islands. 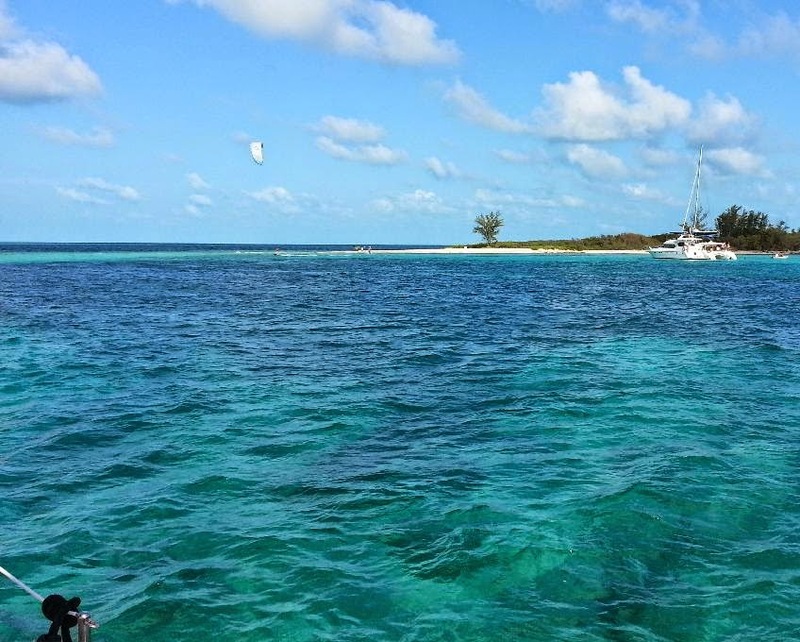 This is a west-facing anchorage on the east edge of the Great Bahama Bank. 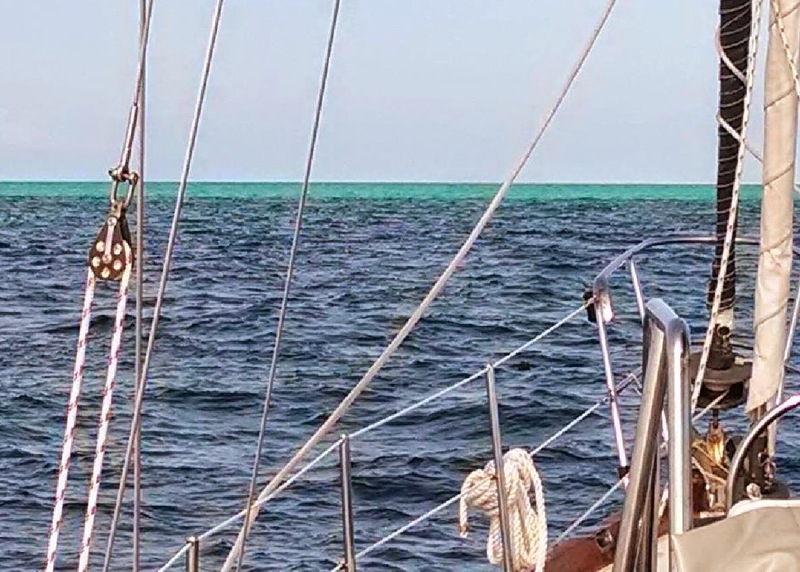 There is nothing between us and Bimini to the west except 80+ nautical miles of Bahama banks. The prevailing winds blow from the east. What all this means is that if we got sloppy about tying the dinghy to the boat tonight, the dinghy would head west without us. By the time we spotted it gone in the morning, it would be halfway to Bimini. We would be unlikely to find it. It's easy to get sloppy, and we have rescued many dinghies in our time for other cruisers. 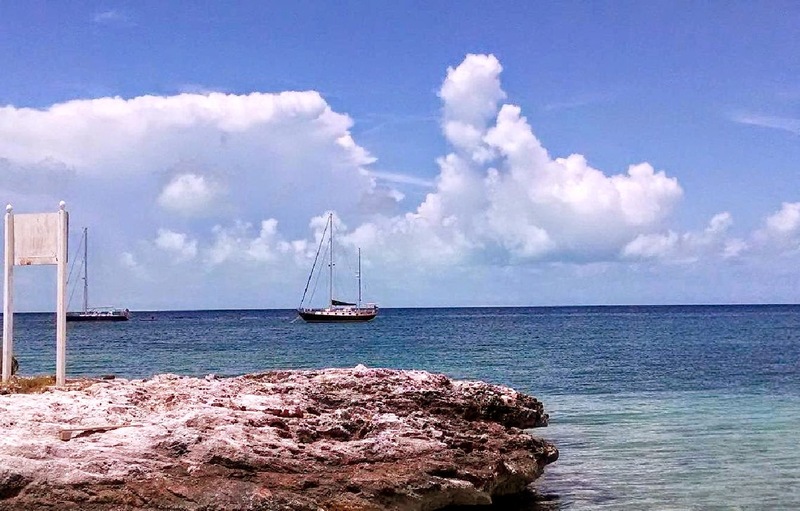 The most recent was in Honeymoon Harbor at Gun Cay. We noticed an empty dinghy heading west, and, naturally it was going to clear the small opening in the harbor, next stop Florida. This wasn't much of a rescue. We didn't have the motor on our dinghy, so I went on deck and blasted the air horn and pointed. There were only a couple other boats in the harbor, and one of them eventually zipped out in a borrowed dinghy to rescue the escaped dinghy. boat. On his first attempt, he overshot the mooring and came very close to running aground on a (not very) nearby shoal. Second attempt, he drifted sideways directly across the mooring ball. He continued drifting downwind sideways and narrowly missed T-boning his boat on the bow of another moored boat. I noticed at this point that his dinghy had come loose and was drifting along quickly by itself. He followed it downwind in his yacht, but his dinghy and he were rapidly heading for another patch of shoal water. I jumped into our dinghy, chased down his dinghy and put it in tow, and explained to him that he should head back to deep water. I decided then, for the protection of all the other boats there (and, OK, because I'm a nice guy) that we needed to help this guy pick up his mooring, so I headed back to our boat with his dinghy in tow to get my son Cash to help. 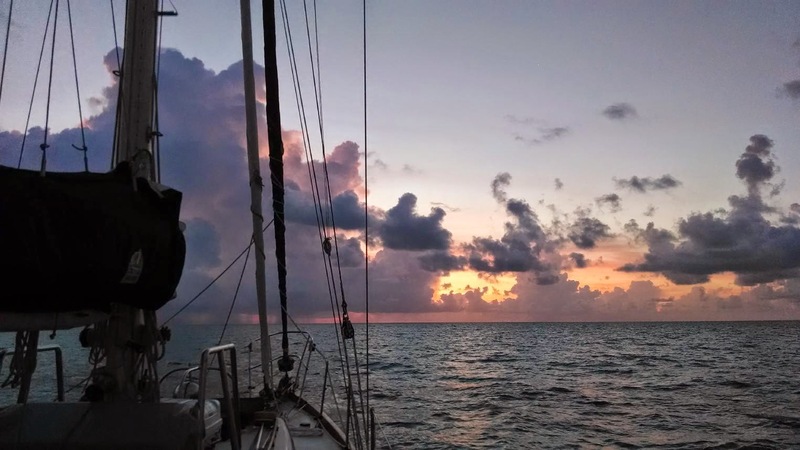 By the time we got back to him, his boat was back on the shallow side of the channel with his staysail wrapped around a large navigation mark. He had been motoring with his sails lowered, so I have no idea how he managed to achieve this I climbed on board and helped him free this mess, and I did eventually get him moored successfully, and I avoided being brained by the large furling drum on the headstay swinging wildly around on his bow. 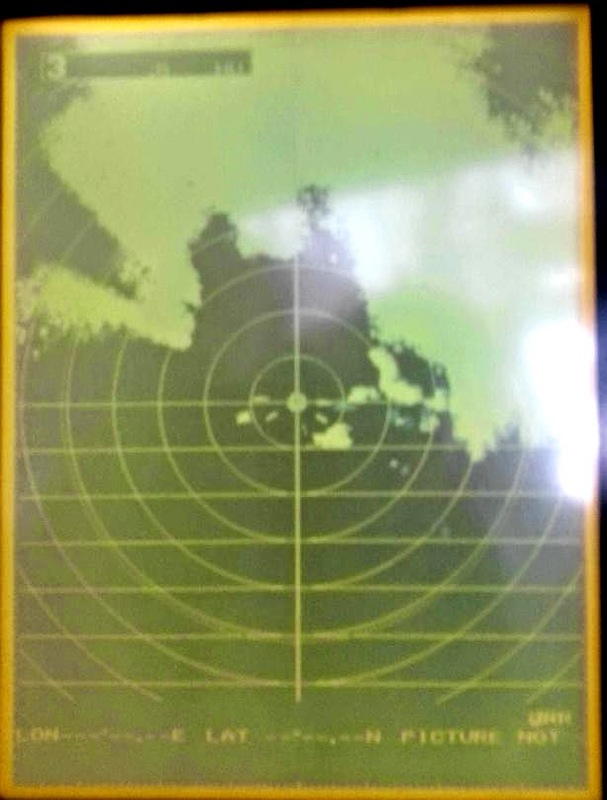 Squall on radar at Bullock Harbor. Also at Dinner Key Cash rescued a dinghy that had washed far up onto the rocks of an island. We never found out who that belonged to because it didn't spend long tied to our boat. Its rotted line soon parted, and we think it headed north towards downtown Miami. It might still be roaming Biscayne Bay. The most memorable rescue was in the Dinner Key anchorage in 1998 the first time Paula and I were cruising on Nora. This was before they had even put moorings in, so we (and everybody else) were at anchor. We had become friends with a Scotsman by the name of Neal McNeal. He had sold his small trucking company in Scotland to go sailing with his wife. Sadly, his wife died before they left. 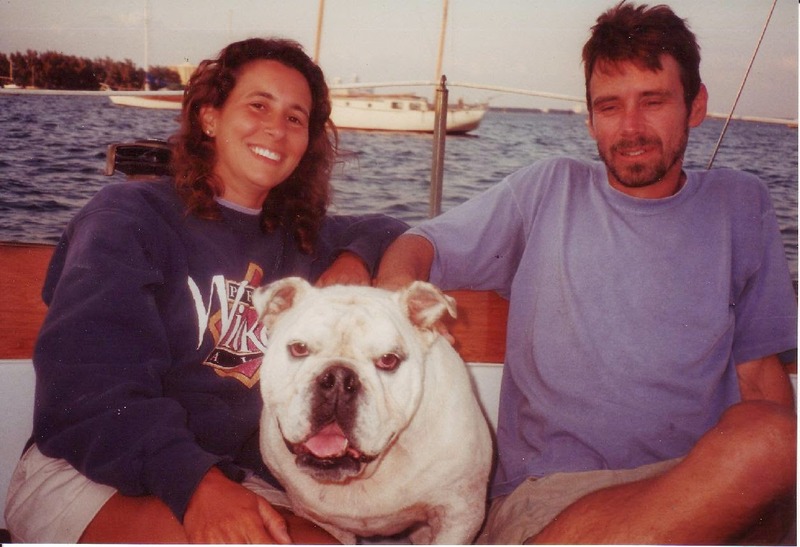 Neal McNeal went sailing anyway with his British Bulldog Sammy. Sammy was absolutely the worst boat dog possible. He was a large white bulldog with the typical stocky build, massive head, and short, almost gnarled front legs. Neal McNeal looked a fair amount like him actually. Sammy was not a good boat dog for at least three reasons. One was that he had horrible balance. I saw him almost fall off the dock several times, and these were large, fixed docks, so I couldn't imagine how he could do well on a rocking, rolling boat. Also Sammy, having short white hair and very pale skin, was very prone to sunburn. Neal tried hard to keep Sammy out of the sun, but he often had to apply lotion of some kind to Sammy's skin. And Sammy couldn't swim. Not at all. One day I was down below in our boat and I heard a repeated faint noise in the wind. I tried to decide whether it sounded like someone yelling for help or like a dog barking. I went on deck and looked around. It turned out to be both. Neal McNeal had returned to his sailboat in his dinghy with Sammy. He had put his supplies on deck, climbed aboard, and accidentally let go of the dinghy. Sammy was out on the bow of the dinghy as far as he could possibly be, barking at the yacht as the dinghy quickly drifted downwind. Neal was yelling help repeatedly. He of course now had no dinghy with which to rescue Sammy, and he was afraid that Sammy, having failed to carefully consider his complete lack of swimming ability, would jump into the water to get back to his rapidly receding home. Our outboard wasn't working at the time (that outboard never worked more than three times in a row), but I jumped into our dinghy, rowed out, and brought Sammy home. Paula, Sammy, Greg in 1998. We never saw them again after we left for the Bahamas, but I hope Neal McNeal and Sammy had some great cruising together.